Shame on us Judges for letting an obvious typo through without at least mentioning it. That is a bad mark on the SoV, not the submitter. That said, we do not expect submitters to have the skills of the C3V Editing team. Once a unit has passed review the wording of the powers is altered and the card artwork updated. The card will remain the same, but will be up to United Fanscape standards. Sundol has received to Nay votes to induct (superfrog and Son of Arathorn) and is removed from the process. Prince Al- fabulous he- Al'kahora. Genuflect, show some respect: down on one knee. But is he fabulous enough to join the spectacular coterie of the Soldiers of Valhalla? There's certainly a lot of competition in the 80 point hero slot, though there's no real sense comparing him to the number of support Heroes in that range, as the Prince is a pure beater with no particularly meaningful boosts to offer anyone. Against the other stand alone Heroes he compares reasonably well, he doesn’t fill the quite the same role as any of the other options and doesn't stand out as being vastly better or worse than any of them. To be honest, I find the Prince rather bland. There's nothing really wrong with his 'generic fantasy warrior' theme, but it doesn't particularly pop for me either. I love when a unit's theme shines through so well you can picture them in action just by reading the card or playing a game with them, and I never got that feeling with the Prince. I think part of the problem is it feels like Al is drawing from too many places at once. He's a Prince, but also a Knight. He has a vaguely Arabic sounding name, but a rather European looking mini with a sword that looks more like a Katanna than anything else to me. He's Loyal... to something, but you certainly don't get that feeling from his play-style. He's apparently familiar with Pumas, which is a bit odd to me whether he's from Earth (as Pumas are native to the Americas) or Artorus. Overall, I just can't get a feel as to were this guy is coming from. Granted, some of my concerns could be explained by his being from Artorus, as the planet is almost a blank slate at the moment. However, I don't think 'Oh he's from Artorus' should be an excuse to have carte blanche on a wonky theme. Too many submissions that run on that concept and Artorus stops being a planet and instead becomes a bargain bin of random miniatures. That's not necessarily the case here, but it's a slippery slope. The idea of having two mutually exclusive attack bonus powers is quite interesting. At least they're supposed to be mutually exclusive, there are actually a few ways to trigger both powers in the same turn. Still, game not simulation and all that, and overall the Prince's powers are interesting and unique pair. The Prince is pretty much just a beat-stick, though one that can be somewhat tricky to play. He has no real synergies to speak of, leaving him as a filler option for the most part, but at 80 points you typically want filler that serves a more useful role than just offering a decent melee normal attack (or two). Still, between his two special powers often at least one can help out in an army. Strike of the Puma can neutralize counterstrike, defensive agility, and other such powers to some degree, while Razorpetal Stance just offers up some plain old hitting power, both can be useful for the right team. The push-pull nature of his twin powers can make the Prince a bit more interesting to play than your average beat-stick. Often you can find yourself having to pick between gaining height or getting the double attack after the initial Puma rush, and sometimes it's worth forgoing both to get another Strike of the Puma on a different target. Depending on who he is facing and other conditions, the Prince has a lot more options than just 'punch the nearest bad guy'. I may not care for the Prince's theme, but I do like what he brings to the table in terms of tactical decisions. The Prince isn't going to light the metagame on fire and he doesn't do much for me theme-wise, but he's a solid hero that can give you some interesting choices during the game. Not the SoV entry I'm most excited about, but he has a place here. I vote to induct Prince Al'kahora to the SoV. Last edited by Soundwarp SG-1; September 3rd, 2014 at 10:46 AM. I has read the Wheel of Time novel serie, and the name of the powers of Prince Al'kahora remind me of the sword forms used in it. Or think of Syrio Forel of Game of Throne, for another example. I see Prince Al'kahora as a prince from a kingdom with a refined sword art, that favor agility and technics with light swords over just muscle and hacking with a big sword. I am really glad to hear that. That is where I got the idea for the names. Agreed, I think it was a real nice touch. Wheel of Time is what I envisioned too. Heron Wading in the Rushes, Parting the Silk, Apple blossoms in the wind, Folding the Fan. Great, now I want a unit with a power called "Sheathing the Sword". Alright guys, that's enough chatter in this thread. Last edited by capsocrates; August 27th, 2014 at 06:59 PM. Reason: Very doable, SoA. Like: "When an attacking figure would destroy NAME, you may inflict X wounds on the attacking figure." I got a little behind on review writing compared to my testing, so I have a bit of a buffer of reviews I haven't posted. Which means y'all get another from me this week. Sit in a theatre, to see if Ashi-Dulu can conquer the Soldiers of Valhalla! For the most part, Ashi-Dulu is basically a non-bonding Grimnak. He's a bit better than our favorite Dino-Rider going solo in most cases, thanks to the higher attack and better mobility, but Grimnak's true value comes from bonding with the Heavy Gruts and his other Orc synergies. Without comparable bonding and synergies, Ashi isn't going to obsolete big Grim anytime soon. Ultimately, they play different roles and fit in different armies despite their similarities. A giant worm erupting from the sands and scarfing down some helpless sap? Ashi's theme is pretty spot on, whether you're thinking Dune or Tremors. 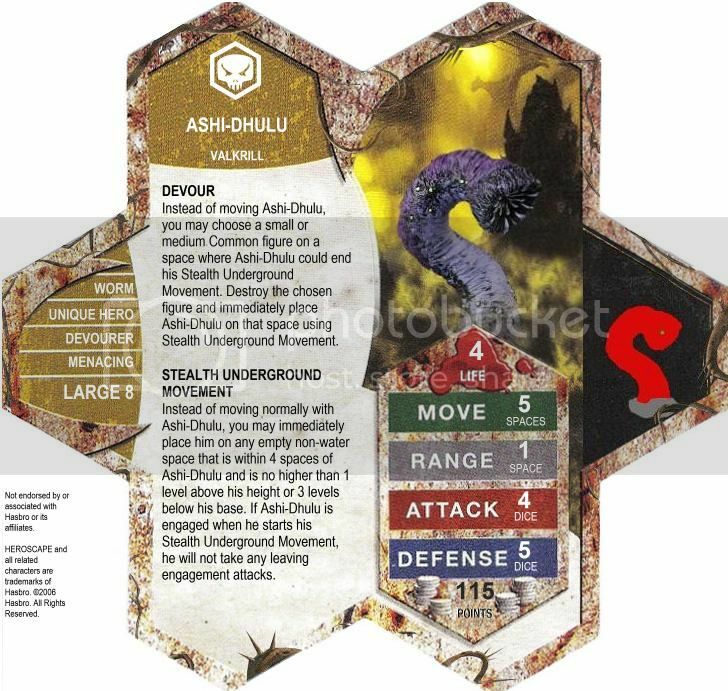 There really isn't much to say here, Ashi's card just nails the 'Giant Worm of Death' thing perfectly. It's pretty obvious what powers a giant death worm should have: burrow around and eat things. That being said, the mechanics of this particular take on the idea are both elegant and fun. Ashi-Dulu plays a bit like Grimnak did in the very early days of just the first Master Set, back when big Grim had no Orc buddies to boost. There are some key differences though; Stealth Underground movement gives Ashi far better mobility that can't really be prevented or locked down, making him a decent assassin, and the 2 extra attack gives him more punch against the enemies that aren't on his menu. He does lack Grimnak's potentially game changing ability to insta-kill Unique Heroes though, and he has no way to bypass the Counterstrikes of the Unique Samurai squads, meaning even 'Retro' Grimnak would still have the edge in some match-ups. In some sort of 'Unique Only' tournament, Grimnak is probably the better pick between the two of them even when denied his greatest asset, though neither would be my first pick. The biggest limit to Ashi is it's not that easy to actually get an attack in after devouring, a smart opponent will keep his figures spaced out to deny it in most cases. Ashi's attack value might be much better than Grimnak's, but that doesn't matter all that much when you can go whole games without actually attacking with him (which I did have happen on more than one occasion). Ultimately, Ashi has his uses, but he never felt overpowered or game breaking. Which is right where he needs to be. Awesome theme and solid mechanics certainly earn Ashi a spot in the SoV for me. Hopefully, the time will soon come where I can bring the conqueror worm to bear in one of the online events. I vote to induct Ashi-Dulu to the SoV.